Valentine's Day tomorrow and I'm trying to work out if the weather will be good enough afternoon in the afternoon to fly a marriage proposal down in Hampshire. I'm undecided as to where I should operate from, Blackbushe or Goodwood as the distances are almost equal. There's a small advantage in the latter, as if the weather turns nasty between Manston and either destination, I can fly higher and avoid being squeezed into the very narrow, low-level airspace which passes over the high ground tracking the M25 at Biggin Hill. I've had an interesting job booked for the end of the month, by a film company that wants two aircraft up simultaneously. I think it's for the next installment of a well-known television advertisement but quite how I might get a Meerkat to wing-walk, I can't say. Duct tape is always a useful solution to most problems in unusual circumstances. Back to Thanet and the action still surrounds the Royal Sands development at Ramsgate. I think we risk losing sight of the fact that projects, such as these, are approved with the very best intentions on the part of the Council, in a part of the country that is desperate for regeneration. Occasionally or as a consequence of the prevailing harsh financial climate, developments fail or struggle, for one reason or another; the Sea Bathing Hospital development at Margate being one very good example. Royal Sands is now the subject of intense public scrutiny and I will be most interested to see the outcome. However, what none of us want to see, is a derelict site blighting a strategic position on Ramsgate's seafront for many years to come. 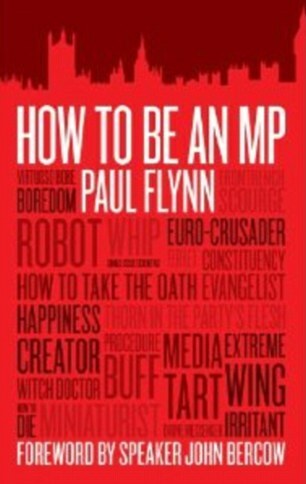 Along with Karl Marx' Trip Advisor review of Margate and Nye Bevin's recollections of the political career of Iris Johnston, I see that the most popular reference work in the House of Commons library, a self-help, style-guide by Labour MP Paul Flynn, on 'How to be an MP', was the most borrowed book from the House of Commons library last year. Thinking I might learn something about the inner struggle that defines the somewhat opaque Westminster village, I've just bought a copy for my Amazon Kindle reader. I have to assume that young Will Scobie is way ahead of me though! Paul Flynn wrote to me once. "Whistleblowers do a valuable job". I was not actually a whistleblower. I was a crime complainant. I complained alleging fraud by a defence manufacturer, in Flynn's constituency, against MOD. The factory closed with 1200 redundancies. In the Commons he was pleading for yet more grant aid because of the disastrous loss of jobs in his town. I think the Newport Celtic Lakes development copped 1.6 billion. IIRC that would be about the time Fords at Bridgend threatened to close unless further grant aid was given. Big Batteries of Cwmbran did the same IIRC. But Matsushita (Panasonic) were warning Wales that grant aid alone would not keep providing jobs like welfare benefits. Unless education standard in Wales improved they predicted that inward investment must dry to a trickle. Tech colleges in Wales had lent towards bespoke training for the needs of grant aided employers. Gaining dispensations to lower academic standards, for example HNC validations that might not reach the standard of an English ONC. Paul Flynn appears to have the necessary skill for a politician. Don't publicly tell it like it really is. Which tbh is you pretty much stymied as you have been consistently too accurate in spelling out economic realities ! You want votes ? Tell em you want grant aid to build that ice rink and olympic standard swimming pool.